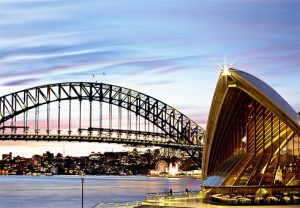 Moving to Australia: five of the top 10 visitor photo locations are in and around Sydney, Instagram says. Moving to Australia: Melbourne is the second most popular place with four locations most favoured by visitors that upload pics to the social media site. Top of the Instagram list is Sydney’s iconic Bondi Beach with its stunning blue sea and picture-postcard sunsets. Surfers Paradise Beach in Queensland is 2nd most popular Instagram location in Australia. In third place is Sydney Harbour, the waterfront area previously known as Port Jackson. The world-famous Sydney Harbour Bridge is 4th most photographed location for uploaded visitor pictures. Victoria’s St Kilda Beach is fifth most popular place for visitors to take holiday pictures for Instagram. Melbourne’s National Gallery of Victoria is the sixth most popular place in Australia for pics broadcast on the social media site. Named as Instagram’s seventh most-photographed placed place, The Grounds of Alexandria is a trendy cafe located in an old warehouse in Sydney’s inner-east dsictrict. The Melbourne Cricket Ground is the eighth most popular Instagram location among visitors Down Under. Sydney’s Taronga Zoo is the ninth most popular Instagram location in Australia. In tenth place is Melbourne International Airport.